Converts photos into charcoal sketches. Is there a better alternative to CharcoalArtist? Is CharcoalArtist really the best app in Image Editing category? Will CharcoalArtist work good on macOS 10.13.4? 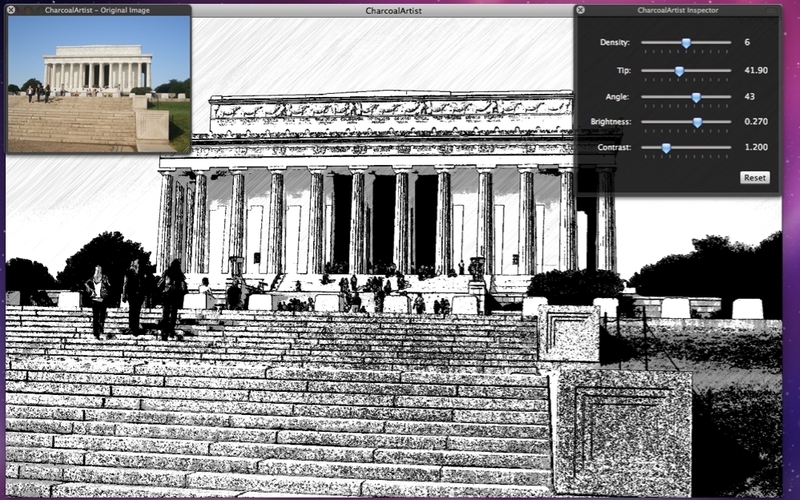 CharcoalArtist automatically converts any image you can open on the Mac into a charcoal sketching. Use the inspector panel to get full control of the exact charcoal look you want by adjusting the charcoal density, tip, angle of sketching, brightness and contrast. CharcoalArtist instantly renders your image. Corrected the Reset button in the inspector panel for compatibility with OS X 10.7 Lion. CharcoalArtist needs a review. Be the first to review this app and get the discussion started! CharcoalArtist needs a rating. Be the first to rate this app and get the discussion started!